Specifically, the NIST results suggest the sensors could be used to track levels of ionizing radiation (with energy high enough to alter the structure of atoms) used in food irradiation to destroy microbes and in medical device sterilization—estimated to be a $7 billion annual market in the U.S. alone. The sensors also have potential applications in medical imaging and therapy, which together are projected to total nearly $50 billion in annual value worldwide by 2022. 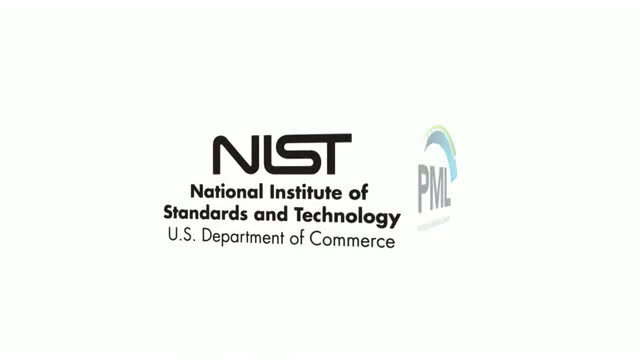 "When we looked at publications on the subject, different labs were getting dramatically different results," said project scientist Zeeshan Ahmed, who is part of NIST's Photonic Dosimetry Project and leader of NIST's cutting-edge Photonic Thermometry Project. "That was our main motivation for doing our experiment." "Another motivation was the growing interest in deploying photonic sensors that can function accurately in very harsh environments, such as close to nuclear reactors, where radiation damage is a major concern," Ahmed said. "In addition, the space industry needs to know how these devices would function in high-radiation environments," said project scientist Ronald Tosh. "Are they going to get damaged or not? What this study shows is that for a certain class of devices and radiation, the damage is negligible." 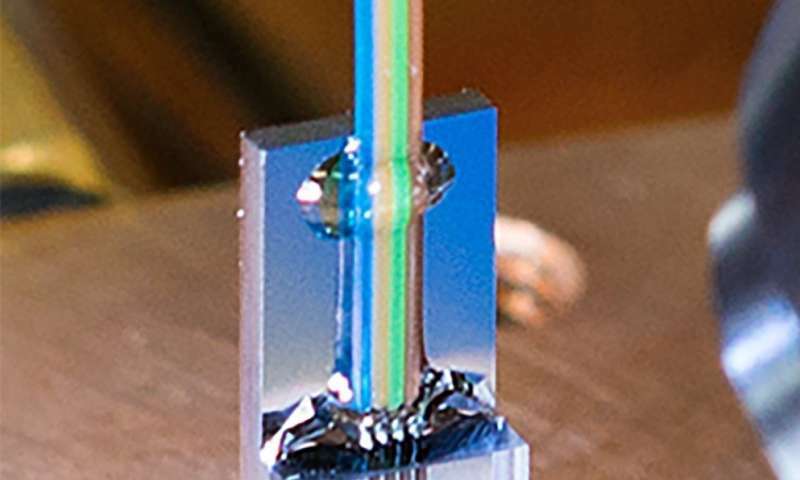 Photonic sensors such as the one pictured here transmit information with light instead of electric currents. Recently, NIST scientists tested whether radiation hurts these sensors' performance. In this setup, scientists put a photonic sensor under a powerful radiation-producing electron beam. The beam travels down a shaft and hits a shutter which can be closed to stop the beam or opened to allow the beam through. When the beam hits the chip, it glows. From the control room next door, physicists can manipulate the beam and monitor the data telling them how the chip is performing. Scientists hope to use these chips someday as sensors in areas with high levels of radiation, such as in space or near equipment used for medical imaging and cancer radiation therapy. Credit: Jennifer Lauren Lee/NIST. Music Credit: "The Messenger" by Silent Partner. "We found that oxide-coated silicon photonic devices can withstand radiation exposure up to 1 million gray," said Photonic Dosimetry project leader Ryan Fitzgerald, using the SI unit for absorbed radiation. One gray represents one joule of energy absorbed by one kilogram of mass, and 1 gray corresponds to 10,000 chest X-rays. This is roughly what a sensor would receive at a nuclear power plant. "It's the upper limit of what our calibrations customers care about," Fitzgerald said. "So the devices can be assumed to work reliably at industrial or medical radiation levels that are hundreds or thousands of times lower." Food irradiation, for example, ranges from a few hundred to a few thousand gray, and is typically monitored by its effects on pellets of alanine, an amino acid that changes its atomic properties when exposed to ionizing radiation. "Our results show that these photonic devices are robust in even extreme radiation environments, which suggests they could be also used to measure radiation via its effects on physical properties of irradiated devices," Fitzgerald said. "That should come as good news for U.S. manufacturing, which is anxious to serve the large and growing market for precise delivery of radiation at very small length scales. Photonic sensors could then be developed to measure low-energy electron and X-ray beams used in medical device sterilization and food irradiation." They will also be of great interest to clinical medicine, in which physicians strive to treat cancers and other conditions with the lowest effective levels of radiation focused on the smallest dimensions to avoid affecting healthy tissue, including electron, proton and ion beams. Reaching that goal demands radiation sensors with extraordinarily high sensitivity and spatial resolution. "Eventually, we hope to develop chip-scale devices for industrial and medical applications that can determine absorbed dose gradients over distances in the range of micrometers and thus provide unprecedented detail in measurements," said project scientist Nikolai Klimov. A micrometer is a millionth of a meter. A human hair is about 100 micrometers wide. The team's results may have large implications for new medical therapies that employ extremely narrow beams of protons or carbon ions and medical sterilization processes that use low-energy beams of electrons. "Our sensors are naturally small and chip-scale," Fitzgerald said. "Current dosimeters are on the order of millimeters to centimeters, which can give erroneous readings for fields that vary over those dimensions."